The user guide is being developed to help new users understand the functionality of the Supporters Community pages, and how to get the best experience from each visit. We are still very much in the early days of developing the Community area and will evolve the user guide accordingly. So, these pages are currently being developed and subject to regular changes (and your feedback 😉 ). The Community pages are similar to other social networks available on the world wide web, and have many features that Facebook users for example, will recognise. We felt that it was important to have our own in-house community that we can tailor to our specific needs whilst also interacting with existing networks such as Facebook, Twitter etc. The CFM Community area is divided into four sections: Supporters, Groups, Forums and Activity. Each section has it’s own site-wide Directory Page but can also be accessed from a Supporter’s Profile Page – in the latter case only information relevant to that individual is displayed. The Supporter’s Directory is the default page when clicking on the ‘Supporters’ link in the Community Sidebar Menu or Admin Bar drop down menu (see Navigation). This is the main index for searching, viewing and interacting with other CFM Supporters. ‘Groups’ are simply groups of Supporters that come together around a particular theme or activity. For example, someone may create a group called ‘Organic Bee Keeping’, or ‘Bude CFM Community’. Groups are a way for us to organise our relationships with one another in a way that makes it meaningful and relevant. Group members can communicate with one another through each group – these conversations are called ‘Activity’ (see section below). Anyone can join this category of group and these groups are visible in the ‘Groups’ directory and in search results. Group content and activity is also visible to any site member. An example of a public group could be ‘CFM Feedback and Suggestions’ – a group open to all, to give (you guessed it) feedback and suggestions regarding the CFM! Most CFM Groups are likely to fall into the Public category. Private groups are also visible in the ‘Groups’ directory and search results but the group content and activity will only be visible to members of the group. Only users who request membership, and then accepted, can join the group. As the title implies, this category of group is hidden from the ‘Groups’ directory and does not appear in search results. Group content and activity is only visible to members of the group and only users who are invited can join the group. How Supporters are invited, and accepted into groups can also be managed. Some groups are setup where any group member can invite other Supporters, where other groups are managed only my Moderators or Site Administrators. For example, a ‘Public’ group called ‘Bude CFM Community Council’ could be established where membership is by invite only from a group Moderator or Admin. This would enable moderators to only invite Supporters who live in the Bude area, but still allow anyone to see the discussions (called ‘Activity’ – see Activity section below) and any wisdom/decisions/event dates/minutes etc that emerge from it. Group Forums are specific discussions that are associated with and accessed by ‘Groups’ of Supporter. The Forum Directory lists all forum topics, by all Groups, created within the community, sorted by the most recently active. Through the directory (as with the other Directories) you can search for specific Forums or filter the directory (by Last Active, Most Replies and Unreplied). The sidebar menu allows you to access the four main directories (as outlined above: Supporters, Groups, Forums and Activity) as well as the Welcome Guide and Login/Logout link. This menu is located on the right hand side of every Community page. 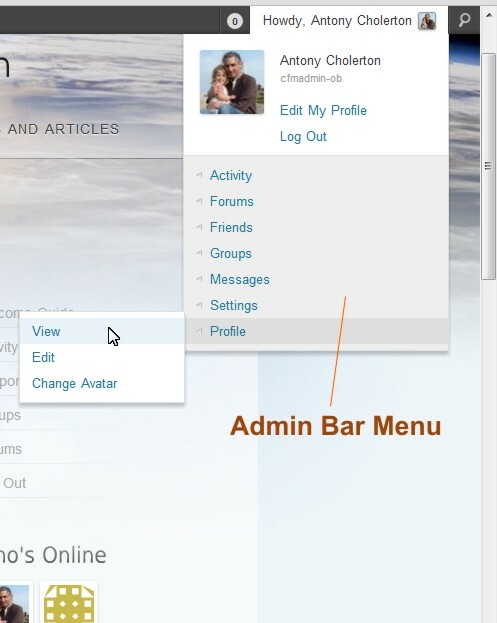 The admin bar is a drop-down menu visible at the top of every page whilst you are logged in. Your name and avatar is displayed in the top right corner – hover over these to open it. 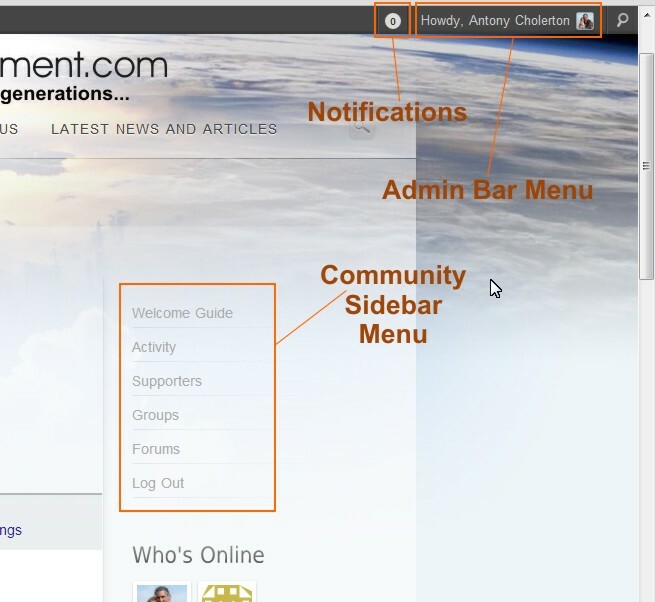 The admin bar includes all links relevant to your Supporter Account and Profile.